For everyone with Irish heritage, St. Patrick’s Day is an exciting holiday. Heck, even for people who don’t have ancestral roots in the Emerald Isle, St. Patrick’s Day is an exciting holiday. 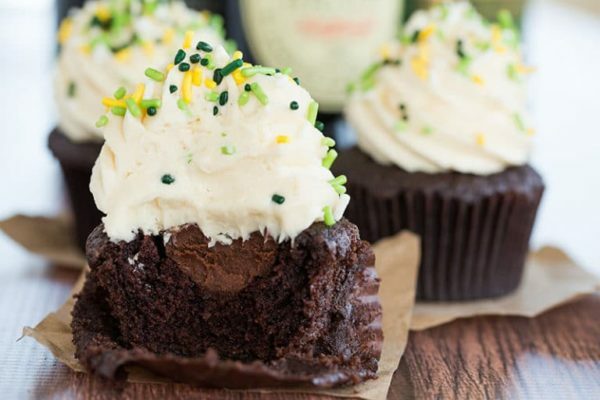 This year, you might want to try upgrading your traditions by making St. Patrick’s Day cupcakes — they will likely pair well with all of the Irish whiskey and Guinness you’re drinking. 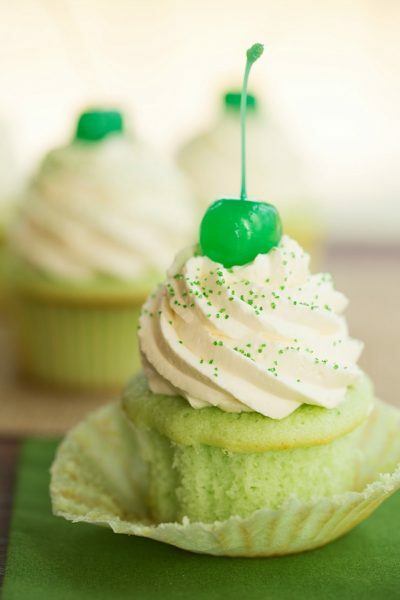 Even if you don’t plan to follow the traditional recipe for St. Patrick’s Day celebrations, which includes copious amounts of alcohol, you should try one of these green-themed cupcake recipes. As you can probably guess, a few of these cupcake recipes call for green food dye — it is the official color of St. Patrick’s Day, after all. But not every recipe requires that coloring for its festive flair. In some cases, it’s all about the green sprinkles. In others, a leaf or rainbow garnish will do the trick. No matter what, St. Patrick’s Day cupcakes are the dessert to eat after chowing down on corned beef and cabbage for dinner. Whether you’re hosting a St. Patrick’s Day party (March 17th does fall on a Saturday this year) or just making yourself a treat — which is always recommended — these St. Patrick’s Day cupcakes will satisfy all of your Irish-themed baking needs. You’ll need: milk, flour, sugar, cocoa, baking soda, eggs, oil, buttermilk, vinegar, vanilla, green food coloring, and green or shamrock sprinkles. This St. Patrick’s Day cupcake recipe from Bakerella uses a red velvet cupcake recipe, but swaps the red food coloring with green. It will taste like a traditional treat, but it won’t look like one. You’ll need: cake flour, all-purpose flour, granulated sugar, baking powder, kosher salt, unsalted butter, whole milk, vanilla extract, mint extract, green food coloring, cream cheese, heavy cream, green sanding sugar, and green maraschino cherries. The cupcake version of your favorite March milkshake will taste even sweeter than the McDonald’s fan favorite. Find the full recipe on the Brown Eyed Baker blog. You’ll need: eggs, granulated sugar, brown sugar, vegetable oil, vanilla extract, flour, unsweetened cocoa powder, baking soda, baking powder, chocolate chips, heavy whipping cream, butter, mint or peppermint extract, powdered sugar, and, of course, green dye. This recipe from My Baking Addiction combines the two best events of this season: Girl Scout cookies and St. Patrick’s Day. What could be better than that? 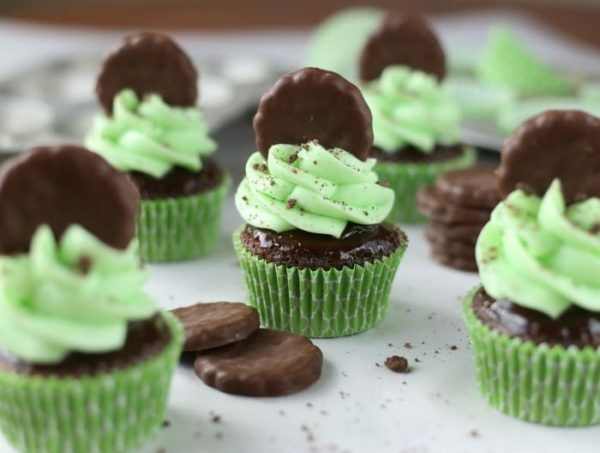 Find the full recipe for Thin Mint cupcakes on the blog. 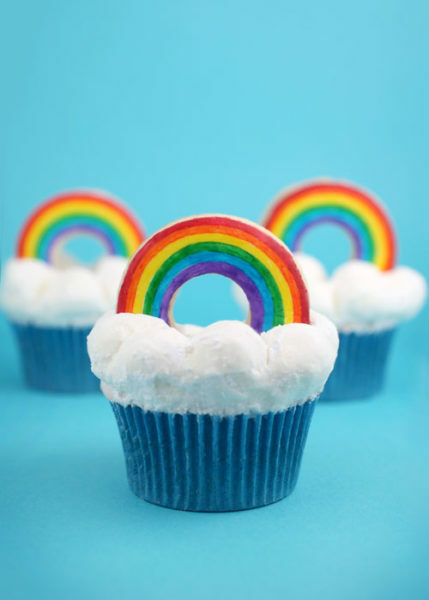 You’ll need: Americolor Gourmet Writing Pens (for drawing the rainbow), all-purpose flour, baking powder, sugar, egg whites, whole milk, vanilla, salted butter, rainbow sprinkles, shortening, and powdered sugar. You finally get to taste the rainbow through a medium other than Skittles. Find the full recipe for the colorful St. Patrick’s Day cupcakes on Bakerella’s blog, and if you’re feeling extra ambitious, add a pot of gold at the end of the rainbow. You’ll need: all-purpose flour, baking powder, whole milk, sour cream or yogurt, pure vanilla extract, unsalted butter, white granulated sugar, honey, eggs, chamomile tea bags, powdered sugar, heavy cream, fresh nasturtium leaves, organic chamomile leaves, and blackberries. 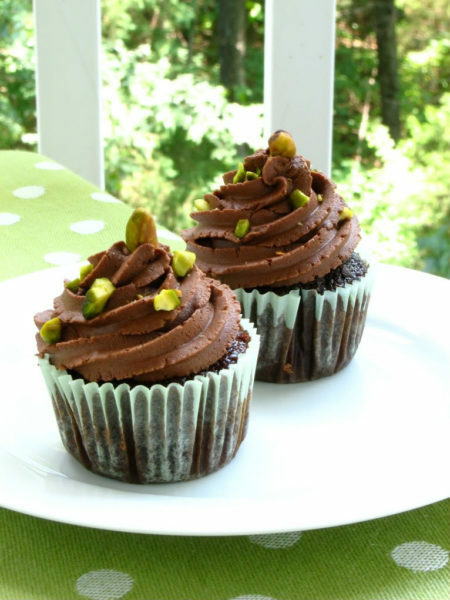 This cupcake will have an earthy, herbal taste, and the garnish of leaves on top provides a subtly festive effect. You can find the full instructions for baking them on A Cozy Kitchen. Also known as Irish Car Bomb cupcakes. You’ll need: Guinness stout, Irish whiskey, Bailey’s Irish Cream, unsalted butter, Dutch-process cocoa powder, all-purpose flour, granulated sugar, baking soda, eggs, sour cream, bittersweet chocolate, heavy cream, and powdered sugar. 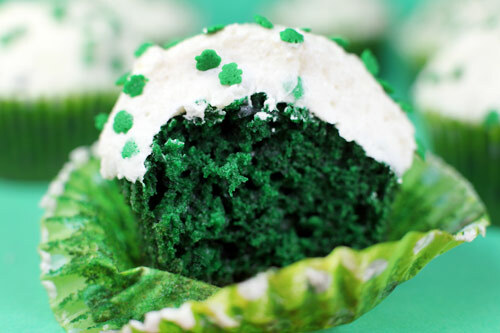 If you want every aspect of your St. Patrick’s Day celebration to involve Irish alcohol, then this cupcake recipe is the one for you. The Brown Eyed Baker blog has concocted the perfect celebratory treat. 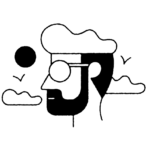 You’ll need: all-purpose flour, sugar, cocoa powder, baking powder, baking soda, eggs, milk, vegetable oil, vanilla extract, heavy cream, package of Instant Pistachio Pudding Mix, solid vegetable shortening, butter, confectioners’ sugar, and pistachios. As you can tell from the list of ingredients, the center of this cupcake has pistachio pudding, so it’s filled — literally — with surprises. The pistachios on top of it add a green accent that’s perfect for a St. Patrick’s Day celebration. Find the full cupcake recipe on Willow Bird Baking. 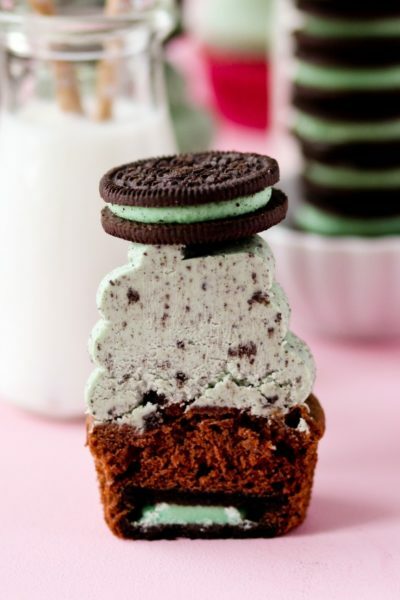 You’ll need: Mint Oreos, box chocolate cake mix, butter, eggs, milk, powdered sugar, vanilla extract, mint extract, and green food coloring. Since this recipe uses a box of cake mix, it might be a little bit easier to make, though keep in mind that the bottom of each St. Patrick’s Day cupcake has an Oreo baked into it. If it sounds delicious, that’s probably because it’s a fool-proof recipe for minty goodness. Check out the full baking instructions from Confessions of a Cookbook Queen. 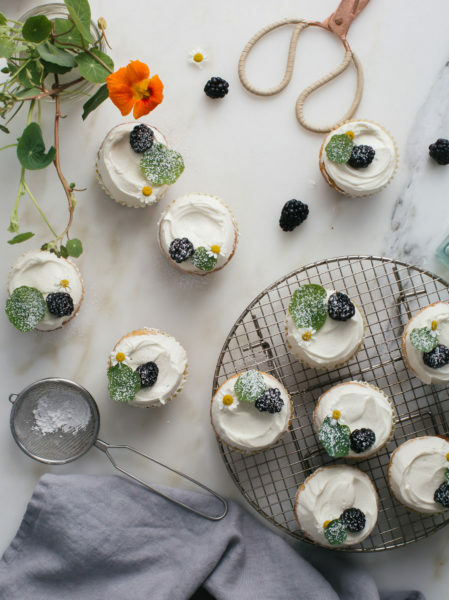 With any of these recipes, you should have enough of a sugar high after eating the cupcakes to put on an Irish jig performance.